His set blended a lot of his signature tracks with some of the ASOT standards that people had flown/driven/crawled in for. And I do mean that. There were people from most of the states that I’d talked to, and over a dozen countries. I’d fallen in love with Alex M.O.R.P.H. after his jaw-dropping debut performance at ASOT 550 in Miami, and while I couldn’t get the fact that he reminded me of a trucker out of my head, the trance came hard and fast. By the time we were three-quarters through his set, the space had crowded in, the seats were filled and the dance floor throbbed. Alex’s sets have always been particularly incredible to me for the simple reason that I don’t have to choose between massive drops or sparkly chromatic trance when I listen to his work. His mixes, especially the ones where he uses mostly his own tracks, have this rambling & chromatic feel to them that encapsulates what makes trance my favorite genre. The tracks veer towards the harder end of the trance spectrum, which it seems Armin, Ferry and the rest of the A State of Trance gang prefer these days. My happy face was probably terrifying the younglings I was sitting next to when I realized there would be no drop in intensity after W&W took the stage. W&W had absolutely killed it the weekend before at Ultra Fest in Miami the weekend before. And I do mean absolutely blew the crowd away. 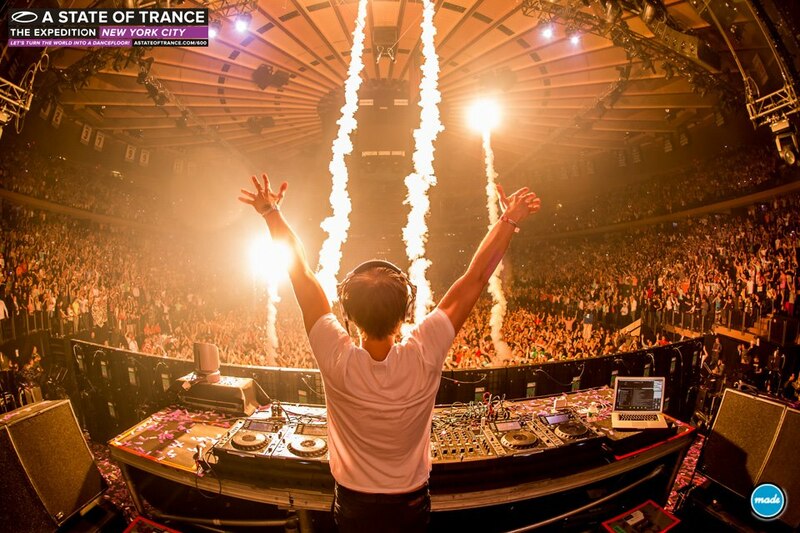 The stream from the event was incredible and a recording of it can be found here: https://soundcloud.com/asot600livesets/w-w-live-a-state-of-trance-600-miami-24-03-2013 The tracks from each set different, but I have to say, the NYC was stronger. Starting with two of their signature tracks and some new sick remix was a fantastic choice. Fans of the podcast exploded when they heard Lift Off! but the place erupted even further when the chords in their absurdly epic hit Moscow began to drip through the gargantuan system. The Lucky Date vs Noisecontrollers remix was a stunning choice that kept the place in this anthemic mindset for what seemed like hours. The energy was brought down with a vocal trance track but then they slid what was essentially a hardstyle track by Showtek into the mix. Couldn’t believe my eyes then, couldn’t believe it now. The massive chord structure of the sparkly hardstyle caught the place’s attention and the crowd and the beat shook through them. This pulled back into their signature bootleg of Clarity, because remixing Clarity was apparently table stakes to being a producer in 2012. A while after that, the sound just…cut out for approximately…4 seconds. This was kind of a stunning moment. I had never seen the entirety of MSG go silent before. I doubt it was the fault of W&W but possibly something in the systems somewhere. The tracks came back up seconds later but the entire momentum of the set had evaporated. ASOT was testing out live streaming both audio and video of the event, and I’d imagine the technical challenges were kind of monumental, given their less than 48hr set up time. They pulled into Invasion, one of the ASOT anthems and the crowd mostly shrugged it off as the driving beat pushed back into their awareness. W&W went 2 for 2 when it comes to their performances at ASOT that I heard, and check the live set if you disagree. New World Punx was astonishing, with Ferry Corsten & Markus Schulz absolutely blowing the city away. There was an edge, an almost punky-vibe that . I’d go over how awesome they were in more detail but I already blabbed about it all over when I declared their set my Mix of the Week. If you haven’t heard it, you have no excuse not to press play on the doohickey right below these words right now. Do eet. By the time Armin came on, I was dazed, confused, and I’d been shaken for what felt like days by some of the massivest (I know it’s not a word) trance I’ve ever heard live. I cannot emphasize how rare hearing these sounds not only in this city but on this side of the planet was/is/will be for the foreseeable future. 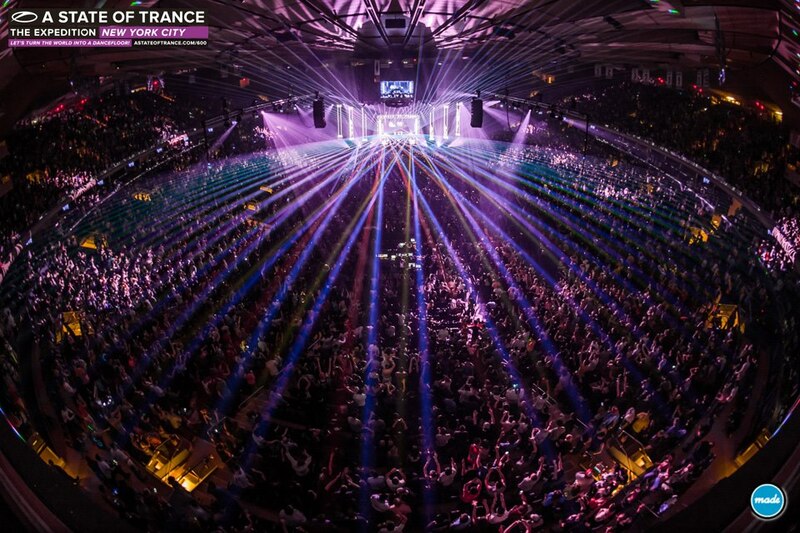 Armin’s set was triumphant, both in that it was happening at Madison Square Garden, but in the tracks, the transitions & the focus on building the audience, and even some of the choices that some of the audience did not (very audibly) agree with. They of course missed the forest for the trees as it were, and were blown away. Repeatedly, sections of the crowd mistook builds or drops for either the end of the show or some break that hadn’t come yet. 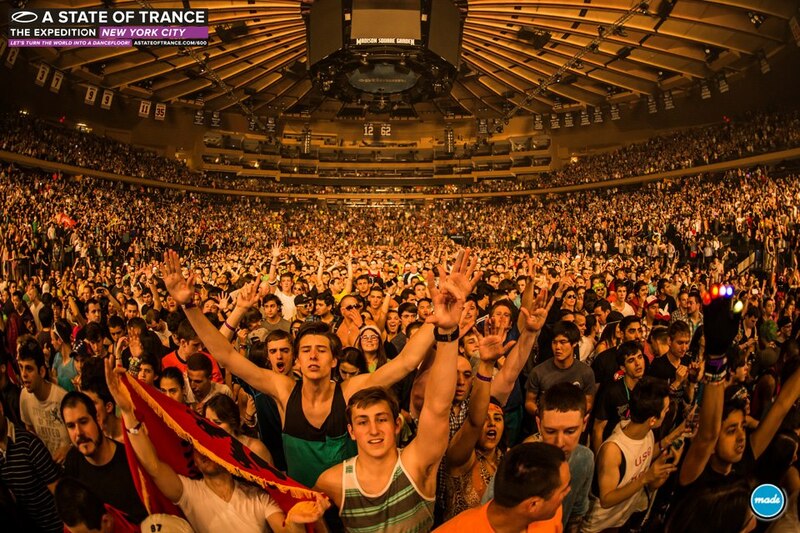 You could almost feel Armin play with the inexperienced NYC audience. We’d not listened to trance live in years, if ever, so he kept building the energy to a fever pitch. Turn it on and turn it up. 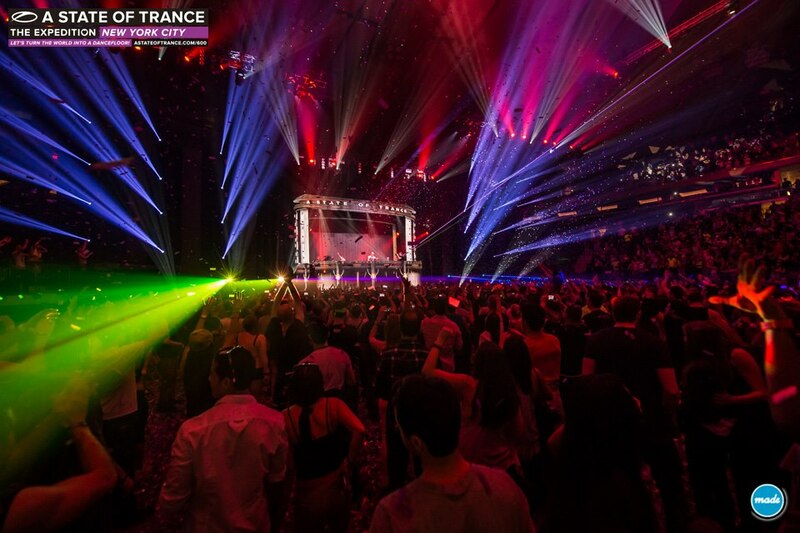 The picture below is the ASOT NYC flag, owned by one Adam Treanor. I’m lucky to say I’ll be releasing an interview with him soon that details how he got NYC to be one of the homes of ASOT600 and how he worked with other ASOT600 promoters around the world to make what went down as awesome as it was. Photos by Made Event & Adam Treanor. This entry was posted in What Lies Beneath and tagged Alex M.O.R.P.H., Ferry Corsten, Madison Square Garden, Markus Schulz, trance, W&W. Bookmark the permalink.